Posted on May 5, 2013 by Big Red	in Funny Booty and tagged funny memes, funny stories, susan boyle, when hashtags go bad. Posted on December 14, 2012 by Big Red	in Parcel Of Pics and tagged funny memes, funny pics, MEMES, pics. Sharks In A Mother F**king Mall. Posted on June 15, 2012 by Big Red	in WTF Booty and tagged fake shark pic, fake sharks in a mall pic, funny memes, internet pictures, kuwait, sharks, sharks at escalators, sharks in a mall, toronto canada. Unfortunately this picture isn’t real although that doesn’t stop it from being any less awesome. The photo is currently doing the rounds under the false premise that it’s authentic and happened in Kuwait’s Scientific Center after a tank containing the sharks was breached. It is in fact a picture from the recent floods in Toronto, Canada and someone well practised in the dark arts has photo-shopped the sharks in. Shhhhh! Don’t tell the Daily Mail. An Open Letter From The Queen To America. Posted on October 17, 2011 by Big Red	in Funny Booty and tagged facebook meme, funny memes, internet memes, queen addresses the usa, queen meme, the queen's open letter to america. This has been doing the rounds on Facebook over the last 24 hours. Thought we should share it with you, a spoof open letter where the Queen addresses America. Her Sovereign Majesty Queen Elizabeth II will resume monarchical duties over all states, commonwealths, and territories (except Kansas, which she does not fancy). Your new Prime Minister, David Cameron , will appoint a Governor for America without the need for further elections. 12. Further, you will stop playing baseball. It is not reasonable to host an event called the World Series for a game which is not played outside ofAmerica. Since only 2.1% of you are aware there is a world beyond your borders, your error is understandable. You will learn cricket, and we will let you face the South Africans first to take the sting out of their deliveries. Close Encounters Of The Second Kind. Posted on September 24, 2011 by Big Red	in Funny Booty, Parcel Of Pics and tagged b3ta.com, close encounter of the third kind memes, close encounters of the third kind, funny memes, internet memes, les dawson, ring of fire. We stumbled upon this on the wonderful and hilarious website B3ta.com. Nearly wet our pants! Well played Ring Of Fire, well played. Presenting Our New Crew Member. 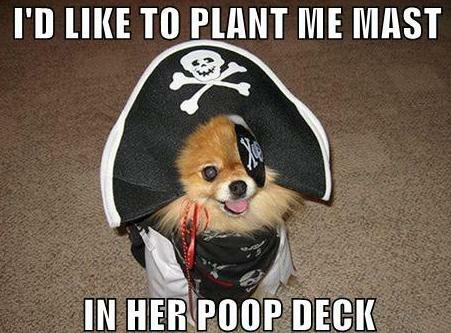 Posted on April 17, 2011 by Big Red	in Funny Booty, Parcel Of Pics and tagged funny dog memes, funny dog pictures, funny memes, pirate dog picture. He’s a scruffy, potty mouthed little fellow…but boy do we love him.